Dos Caminos is a lively spot for Mexican. The Times Square location, with its large corner windows is perfect for people watching. Try to snag a seat near the front where the margaritas are flowing and there is more of a party vibe. The food is just as lively. Favorites like guacamole, tacos and quesadillas can be found, but step outside your comfort zone and you will be richly rewarded. From the ceviche bar emerges Red Snapper De Calle, fresh fish submerged in a lime marinade with Serrano chiles, olives and cilantro served with crispy flatbread. The Posole Verde is more comforting. The stew made with posole, arge kernels of corn, with chunks of crispy pork belly. 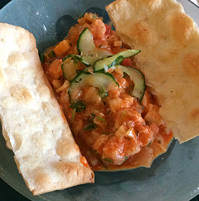 It is topped with a crispy tortilla for added crunch and slices of watermelon radish. Also worth trying are the chicken enchiladas. 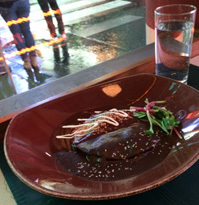 They come smothered in a mole and a tres chiles sauce with crema on top. This dish also packs a nice amount of heat. 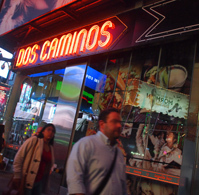 Dos Caminos Times Square has a lot to offer whether you're a tourist or a local.